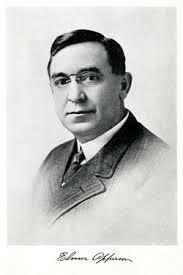 Inventor, Scientist, Industrialist, Educator, Philanthropist Elwood Haynes (1857-1925) was born in Portland, Indiana. From early on, he showed a scientific nature that became evident at the age of 15 when he invented an apparatus for making oxygen gas. In 1886 Portland drilled the first successful gas well in Indiana. 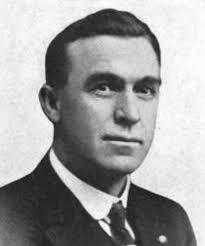 Elwood Haynes was heavily involved in that project and became a widely accepted authority on the subject of drilling, planning and measuring these new wells. Elwood was considered a very quiet, good natured, and religious man in his personal life. When experimenting with gas and metals however, it's not always quiet or safe. The "Gas Boom" was a dangerous time and many of Mr. Haynes' early inventions were geared towards making natural gas safe to use. Kokomo and local businesses continue to follow Mr. Haynes' lead on making our area as safe as possible to work, play and worship for residents and visitors alike. "A man's work in life is not very great at best, when compared with the sum total of human effort, and after all, it is the good that we may be able to do for our fellow-men and not the glory of achievement that really counts." -- Elwood Haynes, Dec. 11, 1918"
"The Father of the Natural Gas Industry in Indiana"
"The Father of the 1st Commercially Successful, Gasoline Powered Automobile in the United States"
"The Father of Stainless Steel"
For more information about Elwood Haynes' life and his accomplishments visit the Elwood Haynes Museum located at 1915 S. Webster St. in Kokomo, Indiana. Elmer Apperson--his portrait is the one on the top left--collaborated with his brother, Edgar, and Haynes on their landmark early cars. He was born in 1861 in Kokomo, Indiana, eight years before Edgar. Elmer became an apprentice machinist at a locomotive shop in Peru, Indiana, before opening his first machine shop in 1888. Before long, Edgar joined him there as an employee. The business primarily specialized in repairing farm equipment, although it also patented some cutting tools used by lumberjacks who cleared forests in the area. Elmer was the first of the brothers to have serious contact with Haynes, a veteran of Indiana utilities who'd been walloped by the incredible notion of adopting waste gasoline distillate, a byproduct of natural gas, as an internal-combustion fuel. 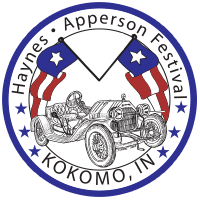 Haynes, who also lived in Kokomo, had gotten hold of a single-cylinder Sintz marine engine and then approached Edgar Apperson about building a car to accommodate it. That car clattered through the streets of Kokomo on July 4, 1894. The bigger reality, the one that propelled the cars of Haynes and the Apperson brothers to enduring fame, was that Elmer Apperson became one of America's first racing stars, driving a second car, designed by Haynes and powered by an opposed flat twin, in the Times-Herald race held in Chicago in 1895. Haynes and the Appersons then built a third car, called the Trap, which drew so much attention during a barnstorming tour that they incorporated Haynes-Apperson in 1898. The brothers finished one-two in the New York-to-Buffalo Pan American Exposition race in 1901, which stopped short of its scheduled distance when President William McKinley was assassinated in Buffalo. That same year, however, the brothers and Haynes had a falling out and split to form their own car companies. Apperson, the brothers' new firm, gained serious notice early on for a performance roadster called the Jack Rabbit, which the company guaranteed would do 75 MPH. Surprisingly, both Haynes and the Appersons lasted moderately long after their corporate divorce. Always the race fan, Elmer Apperson dropped dead of a massive heart attack while spectating at the Beverly Hills board track. 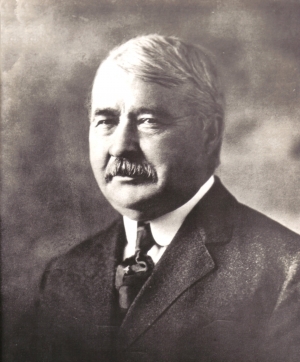 Haynes died of pneumonia in 1925, just before his company was liquidated. Seeing his own company facing the same fate a year later, Edgar Apperson sold his shares and retired to Arizona, where he died in 1959.